HEALTH HAIR is a special micronutrient formulation to improve hair growth and quality for those individuals who suffer from nutritional deficiencies. Hair loss and sporadic baldness due to illness, stress and nutritional deficiencies may be reversed when the proper nutrients are restored to the body. HEALTH HAIR contains a specially formulated combination of B-complex vitamins that can help to enhance and strengthen hair. HEALTH HAIR also contains essential minerals such as Iron and Zinc. 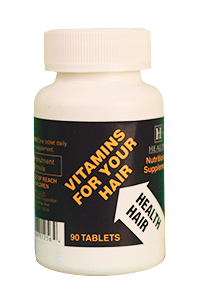 A deficiency of these vitamins and minerals can cause brittle hair and can lead to hair loss or lack of new growth.